If you live in Florida, you can sure expect to see an alligator at some point. 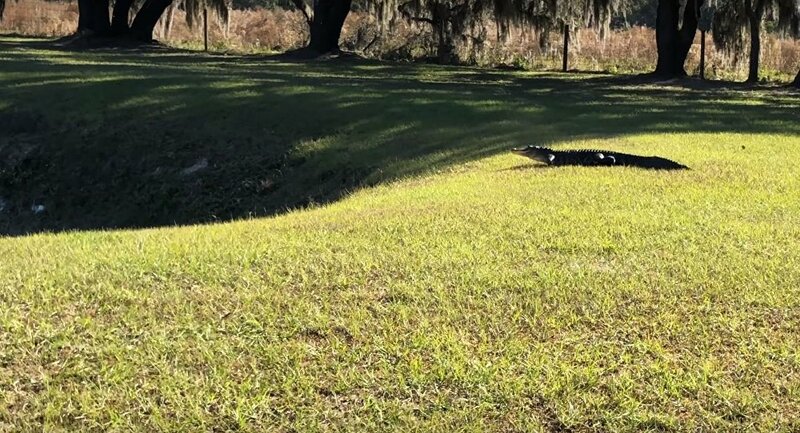 However, with gator mating season just around the corner, the reptiles are being spotted in the most unusual places, raising eyebrows among Floridians. On Friday, the Fort Myers Police Department shared a post on Facebook about being dispatched "to a call of an alligator that had torn through a lanai screen and was camped out on a resident's back porch." The police officers shared a photo of them posing — wide-smiled — with the eight-foot-long alligator, which was eventually handed over to Florida Fish and Wildlife officers. The same day, Chelsea Brinson shared a video — which has since gone viral — of a gator casually walking across a highway in Fort Myers, unfazed by the cars buzzing by. ​In Polk County, a gator was found hanging outside of South County Jail, while in Palm Beach Gardens, an eight-foot, 300-pound alligator decided to take a dip in a family's swimming pool. Lisa Powell Niemiec even shared photos of an alligator making his way into the North Lagoon at the St. Andrews State Park, about three miles east of Panama City Beach. Although these counters are certainly unusual, these alligators may simply be lonely, just looking extra hard for a mate at this special time of year. ​According to Florida Fish and Wildlife, alligator "courtship begins in early April, and mating occurs in May or June. Females build a mound nest of soil, vegetation, or debris and deposit an average of 32 to 46 eggs in late June or early July. Incubation requires approximately 63 to 68 days, and hatching occurs from mid-August through early September."